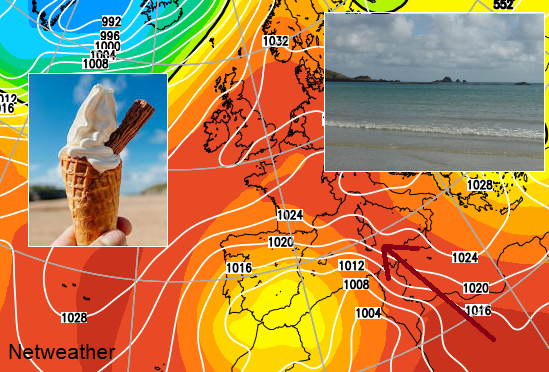 Monday will see a good deal of dry weather for many, with some warm sunshine, but there will be a troublesome front straddling central and southern parts, which will bring some showers for some, which will turn heavy and thundery this afternoon. 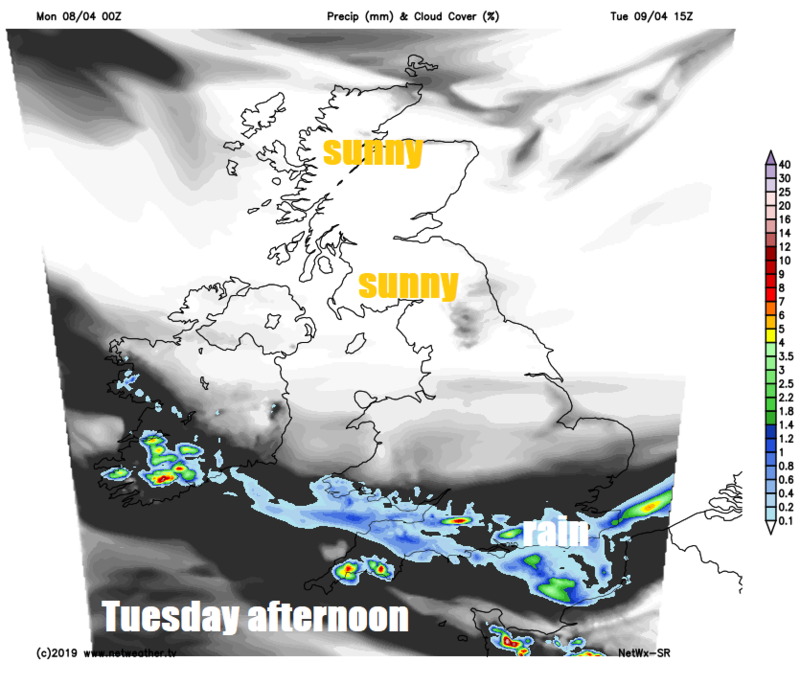 Southern Britain will see cloudy skies with showery and locally heavy rain on Tuesday, dry with sunny spells elsewhere. Showers clearing the south Wednesday morning to leave a drier second half to the week for all, with some sunny spells, but it will turn increasingly chilly, as high pressure over Scandinavia brings a colder easterly flow. 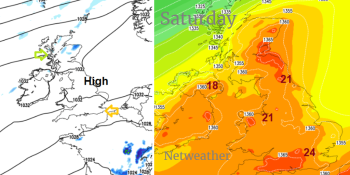 It was a was rather grey and cool weekend for eastern areas, thanks to a moist easterly flow bringing cloud and mist off the North Sea, along with some showers in places. 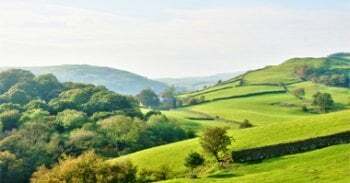 While the west enjoyed some decent spells of warm sunshine, with Valley on the Isle of Anglesey, North Wales, seeing 11 hours of sunshine yesterday, while in Porthmadog further south saw 16.8C. Grey and misty skies have spread west overnight across much of England and Wales, thanks to a warm front pushing west, with a band of showery outbreaks of rain stretching from SE Wales east across south central England, London and Essex. SW England is seeing some sunshine, as is NW England. Scotland largely grey and misty towards the north and east, with a few showers in the northwest, though some sunshine in places too towards the south and southwest. Early low cloud, mist and fog should clear many parts through the morning to leave a mostly dry and sunny afternoon, however, a slow-moving warm front will bring a swathe of cloud from Wales across south central England and onto SE England, with some showery outbreaks of rain. 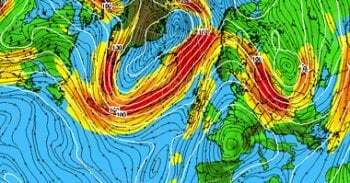 Just to the north of this, warm sunny spells developing across north Wales, Midlands and East Anglia could trigger a few heavy showers or thunderstorms accompanied by hail locally. But further north across much of northern England, Scotland and N. Ireland it will be a mostly fine and bright or sunny afternoon, as will SW England too, though some showers may creep in from the south across Cornwall. Temperatures reaching 10-13C across Scotland, N. Ireland and NE England, struggling along North Sea coasts where low cloud and sea mist lingers. Warmer further south in any sunshine, reaching 14-17C across the rest of England and Wales, perhaps 18-19C across East Anglia. A band of cloud and showery rain along a frontal boundary will slowly sink south across Wales and southern England overnight, showers becoming more widespread and heavy from the southeast across southern England by the end of the night, with the odd rumble of thunder possible. 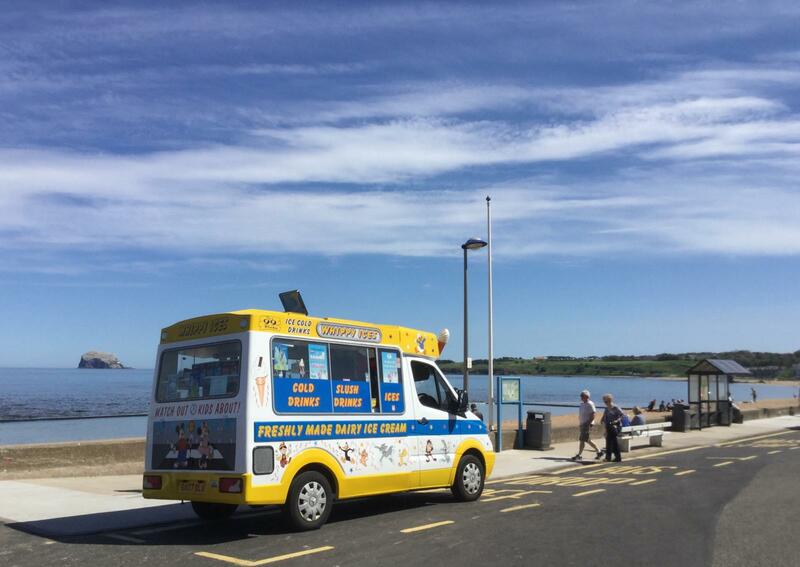 Further north, mostly dry with clear spells towards the west, mist and low cloud possible towards eastern coasts. Most areas frost-free, mild in the south. 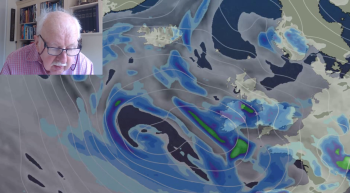 Tuesday looking a largely dry and bright or sunny day away from south Wales and southern England – where we keep the cloud and outbreaks of showery and locally heavy rain for much of the day. Temperatures ranging between 9-13C, so not as warm as today, coolest along eastern coasts and generally feeling cool in the strengthening easterly breeze. 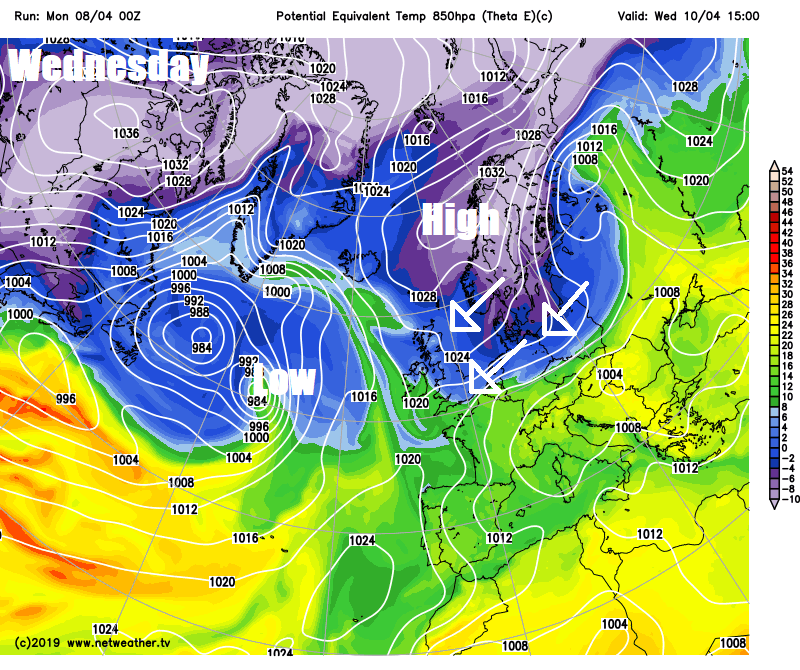 As we head into Wednesday, a strengthening easterly flow will draw cold air from a cold Scandinavia across the North Sea, bringing a cool but mostly sunny day. The exception will be across the far south, where will hang on to the remnants of that frontal cloud, with a few showers at first before clearing by the afternoon. Also, North Sea coasts may be grey and misty. 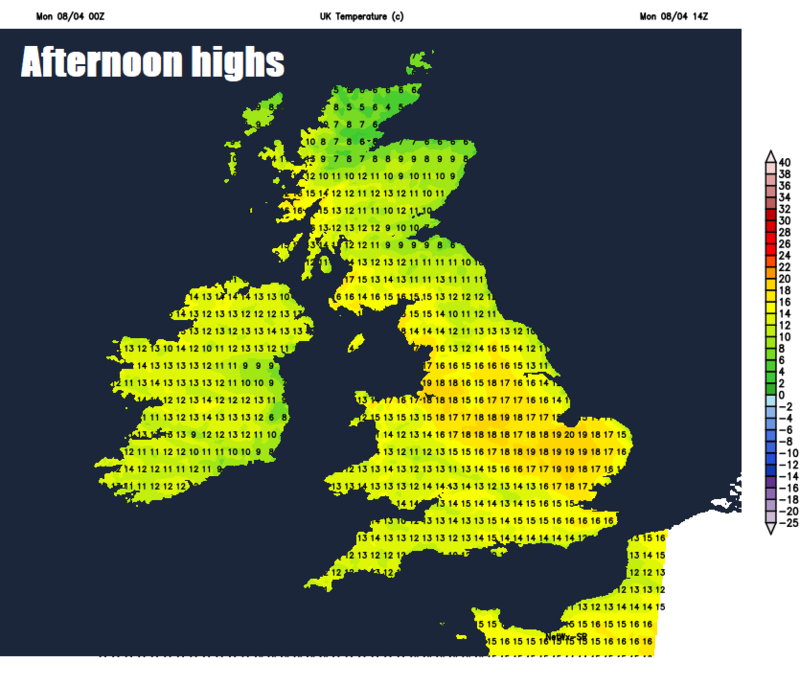 Temperatures reaching 8-10C at best along North Sea coasts, 11-13C further west. 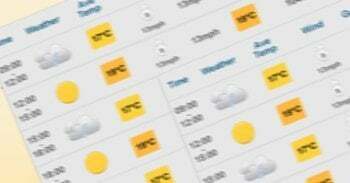 Thursday and Friday mostly dry and bright or sunny, but cool in a brisk easterly wind, which will bring cloudier skies towards the east at times, temperatures reaching low teens at best, struggling along North Sea coasts, where we could see mist and low cloud. A risk of frost overnight under clear skies, more particularly in the west.